Last fall I took up a magical book, and it both broke and healed my heart. It was full of the beauty and care of excellent fantastical writing. Which is to say: Catherynne M. Valente’s The Girl Who Circumnavigated Fairyland in a Ship of Her Own Making was quite good at turning my emotions inside out, and sending them back to me with an extra helping of ‘well, wasn’t that WONDROUS?’ It is no surprise, then, that I am looking forward with glee and expectation to a second novel-length adventure in Fairyland. 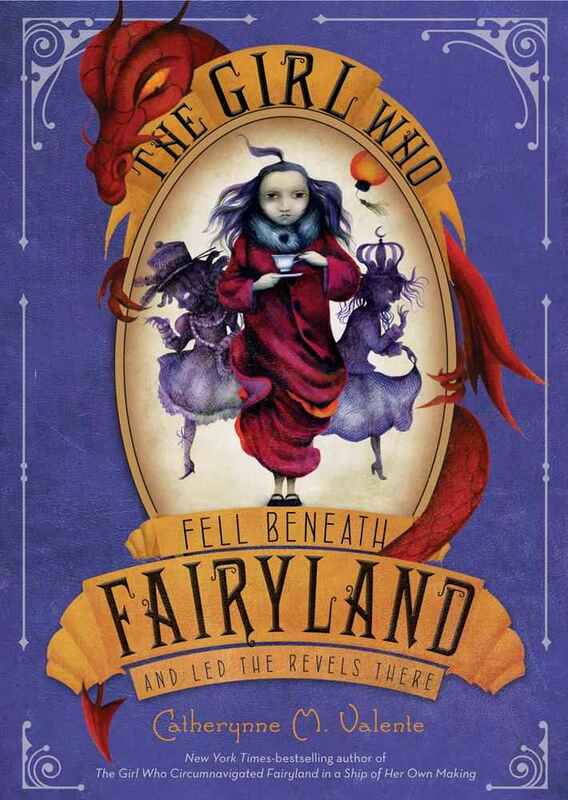 Valente’s The Girl Who Fell Beneath Fairyland and Led the Revels There releases on October 2, 2012 from Feiwel & Friends (Macmillan). And now it’s finally here! Valente’s fans will be thrilled to revel in the lush settings, rich characters, and evocative language of September’s newest sojourn in Fairyland. After all the waiting, dreaming, and planning, September has made it back to Fairyland. However, all is not well there. The last time she visited Fairyland, September sacrificed her shadow to save another. Now, that shadow has become Halloween, the Hollow Queen. As ruler of Fairyland Below, Halloween is stealing shadows from the folk of Fairyland, and with them, their magic. September, determined to set things right, embarks upon a quest to Fairyland Below, a dark, wild place where everything is “slantways, sideways, and upside-down” – even the shadows of her dearest friends, Ell the Wyverary, and the boy Saturday. But can I admit the cover creeps me out a bit? I loved the first one too, so we're both waiting for the second! I haven't read the first in this series yet, but I have heard good things about it! I have not heard of this series before, but it sounds interesting. I love the cover! Thanks for sharing and for stopping by my WOW today!! I really need to read the first one but YES THIS LOOKS AWESOME. Oh, I just got the audiobook of book 1 in this series! I adore the covers of these! Great pick! Sounds ok..though i do prefer pther paranormal creatures to be honest! Though I can't judge either can I? ;) Will look into it sometime.